We're now eight years removed from the market bottoms of 2009. March 9 has come to represent an anniversary of sorts—the day markets started moving in the right direction following a year’s worth of upheaval. As in previous years, this occasion was marked by the usual onslaught of articles pontificating about how much steam this bull market has left in it. Yet, that repetitive angle, while tempting, seems to miss a critical point. In former editions of what feels like an annual March 8 bull market commentary I typically reference the length of this latest bull market and its place in history. I’ve always found a historical perspective more valuable than the fear-mongering click bait produced by financial journalists desperately searching for retweets. Predictably, you get the "Is This Bull on Its Last Leg?” or "Bear Market Ahead?" headlines designed to be more provocative than substantive, but I don’t begrudge anybody from making a living. On the Anniversary of This Current Bull Market, Should Any Long-Term Investor Care? These realizations suggest that looking at things through the lens of bull vs. bear markets really doesn’t make all that much sense, providing you agree that over time markets reward long-term, disciplined investors. 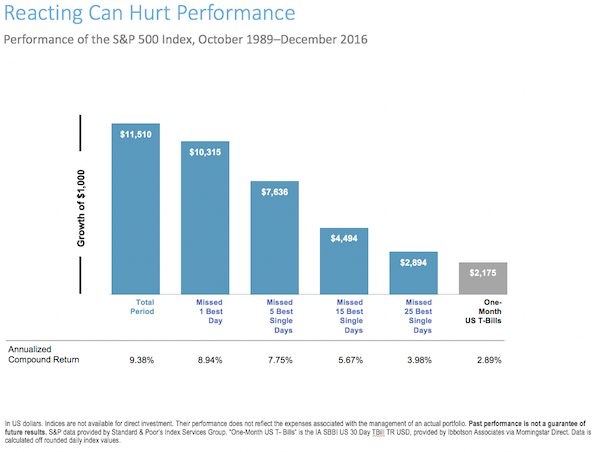 The impact of missing even just a few of the good days is well chronicled, and thereby suggests that time is the ally of the long-term investor and market timing is the adversary.